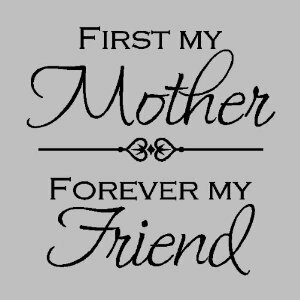 Throughout the years my mother and I have had our fair share of fights, in my twenty years there have been times where I definitely did not appreciate her enough, too many in fact. I have to sit back and remember that she is the reason I’m even breathing, obviously giving birth to me, but she has helped me so many times throughout my life even when I felt I didn’t want help at the time. She is right about almost everything. I say almost because no matter how close you are with a person you are always going to have a difference of opinion on certain topics, but she’s right when it matters most. I think it’s really incredible when you can finally realise that the one hundred percent dependable best friend that will never let you down that you have been searching for your whole life, and may have found in girlfriends, has really been your mother in disguise. In trying to discover who I am as a person (still trying) I noticed that I talk to my mother about everything, even things I don’t tell my best friends, which is why it suddenly hit me straight in the gut that I have the perfect best friend living with me. She listens when I need her to, she has advice on everything, even when I don’t want it, she cooks for me, cleans for me, gets me up on time and keeps our household running and she is not appreciated enough, nowhere close. When I realised how I don’t tell her I appreciate her as much as I wish I did it really upset me because I want to have the relationship we have with my daughter someday and I hope she appreciates all that I do for her. My Mamma will probably never read this but if she does, just know I cried while writing it. Tell your mother you love her everyday, do something to help make her day better everyday, because whether we like it or not some day we won’t have our mothers by our side to help us and that’s really scary to admit but it’s the truth. I love you Mamma and I appreciate everything you do for us all, even though I don’t always show it enough.